Preface. Section I. Cytoskeleton and Cell Cycle. Microtubule dynamics in vitro and their relationship with cellular function (D. Job). Structure and function of two molecular motors and their pathways (R.H. Wade). The cellular machinery for chromosome movement (J.R. McIntosh). The role of microtubules in the creation of order in the cell (R.L. Margolis). Section II. 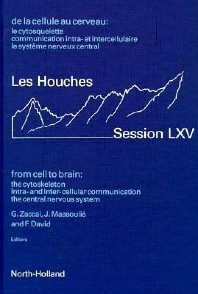 Intracellular Communication - Membranes - Synapses - Time. Intracellular membrane traffic (M. McCaffrye, B. Goud). Signaling in sensory cells. Molecular structure and function of ion channels (U.B. Kaupp). Theoretical models for oscillations in biochemical and cellular systems (A. Goldbeter). Section III. Development of the Central Nervous System. An overview of nervous system development (O. Pourquié, F. Bourrat). Section IV. Student Seminars . Inhibition as binding controller at the level of a single neuron (Information processing in a pyramidal-type neuron) (A.K. Vidybida). Isolated nerve cell response to laser irradiation and photodynamic (A.B. Uzdenski). Section V. Lectures and Seminars presented at the summerschool but not published in the proceedings. The endomembrane system (D. Sabatini). The history of the two-stage model for membrane protein folding (D.M. Engelman). Post synaptic receptors and the organisation of the synapse (R. Kelly). Short reports on Ph.D. student seminars. Conclusion. Relations between physics and biology (B. Jacrot). The first section of this volume corresponds to courses on the cytoskeleton, its various structures and its dynamics, especially during the cell cycle. The reductionist approach is favoured in this field and considerable effort is spent on finding out how these structures are built up from their component molecules, how they grow or decrease in size, how they interact with each other and with other cell components. The second section describes the endo membrane system of a eukaryotic cell and the regulated protein traffic that flows through it. Part III deals with the onset of higher levels of organization. Topics covered include the development of the central nervous system, the role of time in biology and theoretical models to describe biochemical and cellular oscillations. The volume concludes with a reflection on physics and biology and the author shares some of his thoughts on the different ways in which physicists and biologists tackle problems in their respective fields.